CARBONDALE, Colo. (September 30, 2014) – Carbondale is well known as a basecamp for adventure in Colorado’s Western Slopes. It’s also set to become one of the State’s Creative Districts, home to an ever-growing number of creative businesses including artists, designers and small brands which all offer inspiring holiday gift ideas. From custom-made skis crafted from beetle-kill wood to locally roasted coffees selected from growers around the world, to inspiring shorts to crafted vodka and small-batch whiskey, there’s something for everyone on your gift-shopping list. Carbondale is also an ideal pre-holiday weekend mountain getaway, only two and a half hours by car from Denver, with regional airports in Aspen and Eagle-Vail within 40 minutes. Along with pre-Christmas shopping, Carbondale is also the perfect location to access the ski resorts of Aspen Snowmass and Sunlight Mountain or enjoy snow-shoeing, cross-country skiing and hiking from their Carbondale doorsteps. Below features some highlights for the Holiday shopping and Carbondale visits. Osmia Organics is an honest, passionate little company, making beautifully natural soaps, scents, and skin care products in the breathtaking mountains of Colorado. Founded by a doctor with a belief in the power of plants, and a deep desire to help people make healthier choices, Osmia’s mission is to inspire people – through its products and the way we live our own lives – to nurture yourself and help protect the earth’s resources. We want to nudge you to return (literally) to your senses, reminding you to touch, hear, smell, taste, and feel the incredible beauty of your own life. 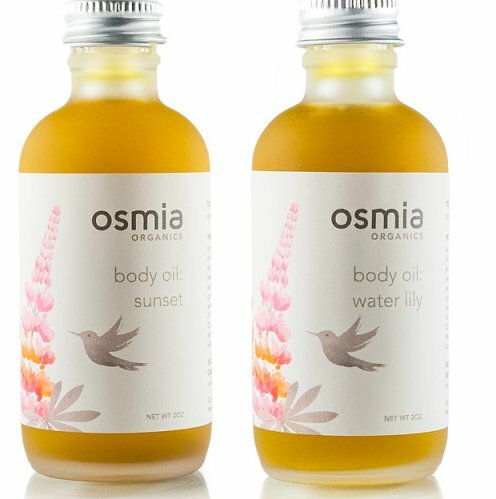 Osmia is well known nationally for products including hydrating body oils and facial serums. This winter, Osmia offers A Perfect Pair: zucca spice + sunset. A luxury organic body soap, and one of our beautiful, velvety body oils make a perfect pair that will leave you with soft, nourished skin. *zucca spice is a limited edition soap for fall and winter (available 9/23/14-3/1/15) From $34. Available at Osmia’s Carbondale store located at 2607 Dolores Way, or online via www.osmiaorganics.com. Meier Skis is the first ski manufacturer to make use of local aspen groves and recycle pine killed by the Rocky Mountain Pine Beetle. High alpine cores give you a light and poppy ride that is easy on the eyes as well as the environment. Meier Skis continues to rise above the rest in performance, graphic design, sustainability and customer service. 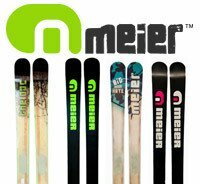 Meier Skis offers a bespoke “build your own skis” package. This package includes instruction by Meier founder Matt Cudmore on all aspects of building. From beginning to end it’s a hands-on approach, with all materials, safety equipment and education provided. The Meier Skis factory outside of Carbondale, Co. Customers will have the choice of how in depth and hands-on they would like to be during the one-full working day the process takes. Each client will pick the ski of their choice from Meier Skis lineup of 10 models and 27 different sizes. Graphics can be chosen from an existing vault or can be completely custom but must be provided and approved prior to the build day. Each experience will be one-on-one and clients will leave at the end of the day with their own brand new pair of fully tuned and waxed skis they built. From $1950. Meier Skis is located at 7800 Highway 82. For more information or to purchase this once in a lifetime experience, please call Matt at 970-510-0029 or email: handmade@meierskis.com. Shredly, a Kickstarter born company based out of Carbondale, Colorado, was inspired to bring a burst of fresh style into the world of women’s athletics. Founded by Colorado Native, Ashley Rankin, who didn’t think there needed to be a compromise between fit, fashion or function when it came to buying mountain bike apparel or any athletic apparel for that matter. She wanted one product that would do it all. Apparel includes shorts, chamois and jerseys all made with quick-dry and slightly stretchy materials offering comfortable and functional multi-sport apparel infused with vibrant colors and innovative designs. Signature shorts from $85. Since launching in 2012, Shredly has developed a loyal brand following from yogis, mountain bikers, stand-up paddle boarders, and women who want comfortable but stylish unique shorts. Shredly is now available at select retailers across the entire US and the UK., Shredly is available in Carbondale at Aloha Mountain Cyclery, located at 503 Colorado 133. Online sales are at www.shedly.com. Marble Distilling Company is set to open doors on its family owned and operated craft distillery, tasting room, and luxury boutique Inn on the east end of Main Street. Construction on an innovative, energy efficient building is slated for completion December 2014. Marble Distilling Company’s handcrafted, artisan spirits will include Vodka, Gin, Liqueurs, and Whiskeys being barreled for future release. Their small batch spirits will be pot distilled using Colorado grown grains and pure Crystal River spring water using 100% American made distilling equipment. Guests will also enjoy contemporary luxury at The Distillery Inn in the heart of downtown Carbondale. Five King sized rooms boast hand-selected sustainable materials, sophisticated finishes and elegant Fili D’Oro Italian linens. Luxurious bathrobes, slippers and bath amenities by Colorado based Ranch Organics compliment the oversized bathrooms. All rooms offer a fireplace and private balcony with breath-taking views of Mt. Sopris, while the garden level room offers a private courtyard with outdoor fireplace, fabulous for night-time stargazing. After enjoying the many area activities, relax while sipping a Marble Distilling Co. original cocktail on your balcony before strolling to a nearby restaurant. Other amenities will include flat-screen TV’s, iPod docking stations, Keurig brewers and a personalized mini bar. Marble Distilling Company will be offering the “Hook Shot” as an opening exclusive – just what you need for holiday gift giving. Perfect for the tree or mistletoe, don’t miss out on having the most fun and unique holiday party or hostess gift – sure to be the hit of the party! Assorted colors and style in various MDC flavors. Starting at $5.95 and available as a boxed gift set. Available at the Marble Distilling Company Tasting Room at 150 Main Street, Carbondale. Room rates at the Distillery Inn from $179. For more information and reservations, please call 970-963-7008 or visit www.marbledistilling.com. Well established and regarded Carbondale designer, David Rasmussen Design, offers fun and functional modern designed home ware, furniture and accessories, all unique and individual. Gift ideas include wooden wine glasses from $65, stunning crafted chopping and breadboards from $119. David Rasmussen Design is committed to providing the highest quality custom furniture to meet our client’s modern design needs. Highly trained professionals handcraft each piece using time-honored techniques. Our goal is to give our customers something that they can’t get anywhere else-exceptional design coupled with construction that is built to last. Shop and showroom is located at 826, Colorado 133. Orders can be placed at davidrasmussendesign.com. Rock Canyon Coffee specializes in roasting premium quality coffee beans from around the world. “Great coffee for great people™” is the philosophy the company has built and use when choosing the variety of organic, Fair Trade and Direct Sourced/Relationship coffees to carry. Rock Canyon Coffee believes everyone should have the pleasure of fresh, small batch roasted coffee at their table or in their business. As a micro roaster, Rock Canyon Coffee finesses the roast time and temperature to ensure each bean tastes as flavorful as possible. This means caramelizing the coffee beans natural sugars to prevent acidic bite and bitterness. The Roaster’s World Tour Gift Subscription from Carbondale coffee roaster Rock Canyon Coffee is a unique way of gifting coffee. It features 12 oz. bags of the freshest, seasonal, small batch roasted coffee delivered straight to the home or office. Depending on the season, Rock Canyon Coffee’s roaster will choose from the well-loved Pacific Rim, Central and South America, and African varietals. All gift subscriptions come with a customized note as well as serving and storing recommendations. Roaster’s World Tour is $13.95 per bag (plus shipping) and you may choose either a 3 or 6-month subscription. Your credit card will be charged each month an order ships. Quantity is up to (6) bags per order. Order online at: www.rockcanyoncoffee.com. For travelers who would prefer to turn their holiday shopping trip into an authentic mountain break, Carbondale offers an authentic mountain weekend break, year-round. It’s renowned for its First Friday Art Walk, where galleries, stores and restaurants open their doors to celebrate craft, design and culture. December 5, 2014 seesLight Up Carbondale kick-off to the Holidays with light ceremony and a visit from Santa. Third Street Arts Center opens its doors with a holiday craft and arts sale. The town has many accommodation gems for weekend stays including the Victorian cottage Euclid House, offering guests the comfort and rejuvenation of a Nikken Wellness Home where they feel cocooned in the restful sleep of magnetic technology; hydrated with pure, alkaline, living water; showering with chlorine-free water; exposed to full-spectrum lighting; and breathing filtered air as if walking in a forest. Nightly rentals are available in the owner-occupied home in downtown Carbondale. Rooms available: master bedroom with private bath upstairs; smaller guest bedroom upstairs with full bath available downstairs. The entire house may be rented by special request, sleeping six. Euclid House rates from $85 per room per night. For reservations visit www.euclidhousebb.com. For other lodging options visitwww.carbondale.com/lodging. Carbondale continues to draw recognition as a leading culinary hotspot of the Rocky Mountains. From ethnic and multicultural to educational and award winning, the town offers a gourmet selection from high-profile chefs including Mark Fischer and Andreas Fischbacher. Fischer’s signature dining spot Town opened a year ago right across the street from the chef’s long-running Asian restaurant Phat Thai. Both have received numerous reviews and recognitions, and are local favorites. Fischbacher was the long-time chef of Aspen Highland’s iconic on-mountain European eatery Cloud Nine, but opened his Italian home-cooking spot Allegria on Carbondale’s Main Street two years ago. Other culinary favorites include The Goat, and Gandhi’s serving the only authentic Indian cuisine in the Roaring Fork Valley. Local watering holes include the newly opened Roaring Fork Beer Company, which opened doors to its new taproom and brewery in late March 2014 and Carbondale Beerworks. More details about Carbondale visits including lodging, shopping, arts and crafts are detailed atwww.carbondale.com.